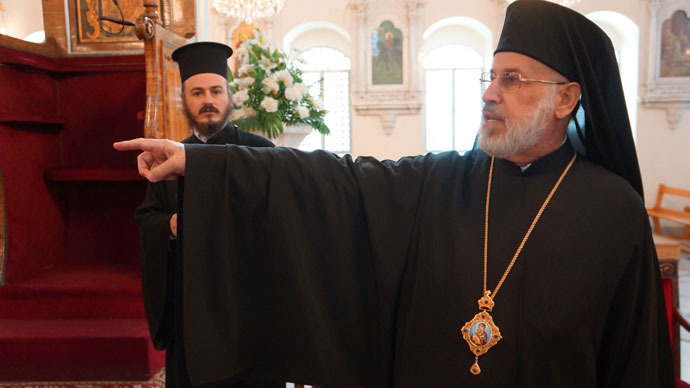 “A person who has no homeland is nothing”, says Orthodox Metropolitan Bishop Luke, an Arab Born in Syria. His forefathers were Orthodox Christians long before Islam came to this land. We are talking in the Maronite Cathedral in the Old City of Damascus.On October 21, 2012, a car bomb exploded here in the Christian neighbourhood near Bab Tuma gate, killing 13 people. The explosion happened during the UN and Arab League envoy Lakhdar Brahimi’s visit to Syria. Just like during Obama’s visit to the Middle East a suicide bomber killed a prominent Sunni preacher Mohammad al-Buti and his students at the Eman Mosque on March 21.The Greek Orthodox Church of Antioch was created two thousand years ago, and is the largest and the most ancient Christian church in the East. All its adherents are Syrian Arabs. The Cathedral was built in the first century AD. Parishes of the Patriarchate can be found all over the world – in the US, South America, Australia, and Europe. Metropolitan Luke is Speaking Arabic, using the usual Muslim expressions, such as “insha’Allah”, Which Means “God willing”;“ziyarat”, Which stands for “a pilgrimage to Holy Site”, ” Alhamdulillah “, Meaning ” to praise God”. He Greets People with “as-Salam alaykum” and calls the Muslims HIS Brothers. Metropolitan Luke is the Patriarch’s right hand. His area of Responsibility is the Cathedrals of Saidnaya and Maaloula, which have one of the oldest icons in the world. Removing your shoes before entering these cathedrals is a must, just like in a mosque. But it’s impossible to get to them now. “Our culture implies no intolerance towards Islam. It’s the basic principle of our relations. We call Muslims our cousins” , says Metropolitan Luke. It’s the Orthodox Lent – the time to offer the most sincere prayers of absolution. Nadezhda Kevorkova: Do you think that the events in Syria are a sign of God’s wrath? Bishop Luke: I do not think so. God is love. This is the Holy Land. Saul was christened and took the name Paul here. The burial-place of John the Baptist is here. Ananias lived here, as well as John Damascene. How could God be angry at the believers? And if God is angry, is he really God? What’s been happening here is in no way connected to faith. If we are being killed by the outsiders, it doesn’t mean that God is angry at us. In our holy country people believe in God, and that’s why they want to destroy us. This crime was initiated from outside Syria. Now that Lent has begun we say prayers every day. We are under attack, all of the Syrian people. These people say they act with Syrian people’s best interests at heart, but it’s not true. We are the Syrian people, and they have been sent to our country from the outside. NK: Do the militants target Orthodox Churches? BL: They kill people. They do not care about people, about human lives. And that’s more important than churches and cathedrals, because if there are no people, there’s no need for cathedrals. They do not care about having killed hundreds of our people, let alone destroying churches or mosques. Our churches have been attacked in all provinces. In Saidnaya the monastery was under fire, but, thank God, a miracle happened – the shell landed in the yard, breaking through the wall, but didn’t explode. It broke in two, with all the gunpowder in one half of it. If not for this miracle, the shell would’ve killed 30 orphan girls. I’ve been there and saw everything. 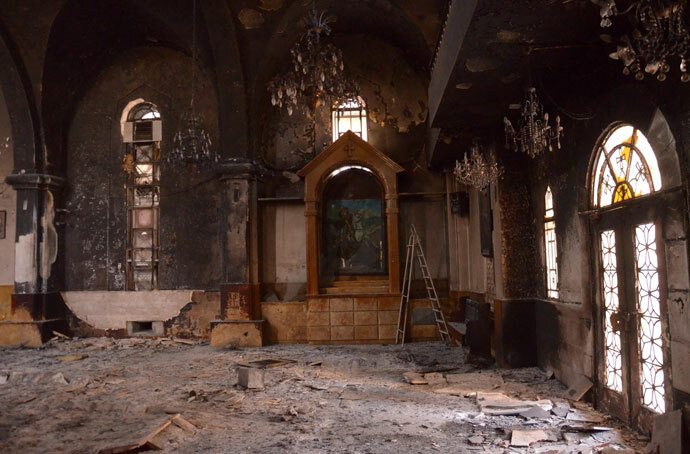 Everywhere – in Harasta, Arbin, Zabadani, Daraa, Aleppo, and around Damascus – our churches and our people have been attacked. They are suffering. Our cathedral in Raqqa has been severely damaged. These outlaws assault parishioners, kidnap and kill priests. Father Fadi Haddad from Qatana was kidnapped and killed when he attempted to rescue his people. They tortured him and killed him. The same happened in Hama. Currently we’re trying to rescue the two priests that remain abducted. NK: Why do the militants resent Christians so much? Is it because they serve in the army? BL: There are people from different communities serving in the Army, all of them citizens of one country. If you look around, you’ll see that young Muslims protect the territory of this cathedral and our other churches. NK: Are there any Orthodox Christians in the Opposition? BL: There are none among the militants. There are two Christians in the National Council in Istanbul, but neither of them has the conscience or moral values of a Christian. One of them, Michel Kilo, has no idea what a church is. Same goes for George Sabra. These are the leaders of the militants who open fire in Christian neighbourhoods and kill priests. Our young generation and the Muslims fight them together. We are ready to die to defend our country and our people. NK: Do Orthodox Christians participate in providing aid? BL: We have experience in that area, and we set up a special office for that a long time ago, when half a million Iraqi refugees came to Syria after the invasion began in 2003. We work hard to send the refugees food and clothes. At the moment Homs is the place that needs it more than any other. NK: The grave of Abel, killed by Cain, is in a Mosque in Syria. Are Christians allowed access to it? BL: This shrine is taken care of by Muslims. Muslims and Christians in Syria are equal in their rights, including the right to pray. We are on the same terms in our country, and we can pray all over Syria, at any sanctuaries. The Umayyad Mosque, which houses a shrine that contains the head of John the Baptist, can be freely attended by Christians, so Orthodox believers go there to pray, although there are no liturgies held there. There is a minaret right in front of the cathedral – it was erected as a token of Christians’ welcoming Muslims in Damascus. This minaret symbolizes peace between us and therefore is called white. All Orthodox holidays, as well as Islamic ones are for everybody – we are used to facilitating each other on them. NK: What are the sentiments within the parishes of the Patriarchate of Antioch in the USA, Canada and Australia? BL: Metropolitan Philip Heads the parishes there. He is even a bigger patriot of Syria than I am. He works in the best interests of the whole community – the whole Church of Syria. The Supreme Mufti and I were supposed to pay a visit to the USA, but unfortunately he was denied a visa. To express solidarity for him, I decided to call off the trip. There surely can be a couple of people in any parish abroad who have their own views of the situation in Syria. But overall, there are mainly Syrian patriots within the Patriarchate of Antioch all over the world. NK: Is there any pressure exerted on the parishes abroad attempting them towards the position of the West on Syria? BL: There hasn’t been any direct Political pressure so far. But there is pressure and a threat of attack by supporters of the Syrian opposition. Some of our parishioners were beaten. Our female Honorary Consul in Montreal was attacked – her chemist’s shop was raided and her husband was beaten. Another attack was on a restaurant owner in Ottawa – for his involvement with the Syrian diaspora. NK: The ancient city of Antioch is now occupied by Turkey, all the cathedrals and sanctuaries are torn away from Syria and now belong to Turkey and are called Antakya, which is a Turkish province. How does the Church look at this? BL: I am among the leaders of the campaign for returning Antioch to Syria. Muslims take part in this campaign, too. I really hope we will get it back. We do believe that we will manage to overcome these hardships and will not only return Antioch but will get back other territories to Syria as well. Damascus is running Antioch’s cathedrals. Turkish culture is fostered in Arab kids in Turkey from early childhood. They face difficulties in terms of language, studying and praying – children speak Turkish and don’t have a command of the language, in which divine service is performed. Basically there is no Orthodoxy in Turkey left, neither are there any cathedrals, sanctuaries or Christians. Russia is the only stronghold of Orthodoxy left. NK: How do you Keep in Contact with this Part of the Church, Given the War and Turkey’s Involvement with it? BL: Our patriarch’s Metropolitan Pavel Brother serves in Aleppo. The Church commissioned him to go to Antakya on a regular basis and pray there. NK: Are there any Orthodox Palestinians in your Church? BL: Yes, there are some among our parishioners. We also have two Palestinian priests in Beirut. NK: Can Orthodox believers of Syria go to Jerusalem and Bethlehem as they used to do two thousand years before the establishment of Israel? BL: We would love to be able to visit our shrines, but we as Christians do not feel like entering the occupied territories. Not a single Syrian priest has ever gone on pilgrimage since 1967. These Lands are oppressed by occupation. NK: The Holy Fire that is lit on Easter’s eve has been brought by pilgrims from the Church of the Holy Sepulchre in Jerusalem to all Orthodox Churches for centuries. Is it brought to Antioch Church as well? BL: Earlier it was brought to us via Jordan, but we haven’t had such an opportunity during the past two years – pilgrims fail to bring the Holy Fire to us. This entry was posted on 03/28/2013, 9:34 and is filed under Uncategorized. You can follow any responses to this entry through RSS 2.0. You can leave a response, or trackback from your own site. when will the CZ goyim waken from their slumber? They have been duped by the anti-Christian eschatology woven into the Bible by the authors of the New Scofield novel. Harriet: This is what zionist propaganda drools over – seeing sectarian violence and the Christian Zionists will just see “Muslim savages” anyway they are so ignorant, gullible and blinkered. I’m disgusted at our western leaders (who can hardly be described as Christians) as they have caused this to happen.